Mingachevir (Azerbaijani: ), is the fourth-largest city in Azerbaijan with a population of about 150,000. It is known as city of lights because of its hydroelectric power station on the Kur River, which splits the city in half. The area has been settled for thousands of years, but the current city was founded in 1948, partly by German soldiers who were taken prisoner during World War II. Mingechevir is also home to Mingachevir Polytechnic Institute. The city forms an administrative division of Azerbaijan. Despite the fact that Mingecevir is a young town, the territory where the town is located is known as an ancient abode. The history of this abode covers a period from the eneolith era (3000 BC) to the AD 17th century. It was the chairman of the Caucasus archeological committee, A. I. Berje, who first gave information about the archeological monuments of Mingecevir at the second congress of archeologists in St Petersburg in 1871. Although this information was not precise, Berje presented Mingecevir as an ancient settlement. After this, Mingecevir remained out of archeologists’ attention for many years. Archeological researches resumed in Mingecevir only in mid-1930s as part of the construction of the hydroelectric power station. The researches started under the leadership of Prof. Pakhomov in 1935. These researches revealed two ancient settlements and cemeteries, which were composed of various types of graves. Unfortunately, World War II prevented the research being completed. The construction of the hydroelectric power station started immediately after the war. This marked a start of systematic and planned research of Mingecevir as an ancient abode. Archeological excavations were carried out from April 1946 to August 1953 by a group of archeologists headed by S. M. Qaziyev in connection with the construction of the Mingecevir hydroelectric power station under a decision by the Supreme Board of the Azerbaijani Academy of Sciences. Over 20,000 historical monuments – graves and tumuli, means of production, things related to daily life, jewelry etc., which reflected historical periods in chronological sequence, were found during the excavations. Most ancient written monuments in Caucasian Albanian alphabet and other archeological finds proved that Mingecevir was a 5,000-year-old abode. The majority of these finds are currently exhibited in the Azerbaijani Historical Museum, while part of them is held at the Mingecevir Historical Museum. History knows a great deal of facts about ancient Mingecevir. Historical sources indicate that a fierce battle took place between the powerful army of Roman commander Pompey and the army of Albanian governor Oris just on the territory of the current dam on the bank of the River Kur in the 1st century BC. Historical facts also prove that the ancient Silk Road laid via Mingecevir. Renowned Turkish traveler Evliya Çelebi, who lived in the AD 17th century, wrote about Mingecevir and described it as a large settlement on the right bank of the River Kur near the Bozdag Mountain. According to him, several mosques, workshops manufacturing fiber silk and silk cloth, bathhouses etc. were operating in this settlement. Interestingly, the road passing from here used to be called the "road of messenger". The "road of messenger" was connecting lots of camelcade and trade roads to Middle East countries and Azerbaijani towns like Saki, Qabala, Samaxi, Barda, Beylaqan and others. A great number of people came to Mingechevir from all districts in Azerbaijan in connection with the construction of the Mingechevir hydroelectric power station, and a total of 20,000 people took part in the construction of this power station. About 10,000 German POWs were among those who contributed to the construction of this power station by the end of the 1940s. The most experienced specialists of the country were involved in the construction of this building site as the biggest hydroelectric power station of the then Soviet Union. Todays Mingechevir, which was built in connection with the hydroelectric power station, was granted a status of town in 1948. 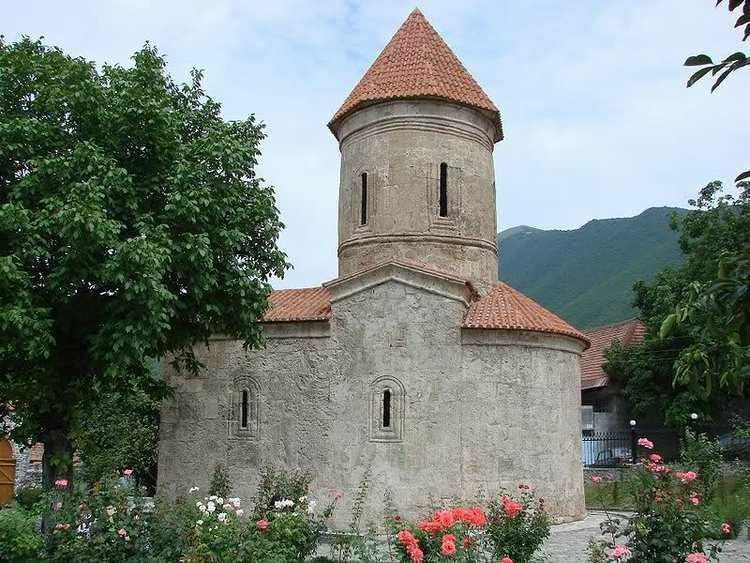 The population of the town currently stands at 120,000 people, including 20,000 internally displaced people from Karabakh and the occupied adjacent districts. The area of the town is 139.53 km². Mingechevir is situated 55 meter above sea level on the foothill of the southeast of the Bozdag Mountain chain and on the edge of the Mingechevir reservoir in the Kur-Araz lowland in central Azerbaijan. The town was built in a mild and warm zone and has warm and dry summer, while mild winter. The average annual temperature is 14 - 15 °C, highest temperature 42 °C (July-August) and the lowest temperature (January-February) -10 °C. The average annual rain constitutes 250–300 mm. The town lies on both banks of the River Kur - a 1515 km-long river, which is the biggest and longest one in the South Caucasus. (The river originates from Turkey, runs down Georgia and Azerbaijan and flows to the Caspian Sea.) Mingechevir is situated in 280–300 km west of the capital of the republic, Baku. As of 2008, Mingachevir fish farm functions in the city, which farms three types of fishes, including carp, silver carp and sturgeon. Sixteen public libraries with 406,677 books in total are operating in the town. The number of subscribers in these libraries stands at 46,282 people. Every book is requested 2.9 times in average annually, and readers took books from libraries 904,395 times in 2011. The Davudova Mingacevir State Theatre was established on the basis of folk theatre in 1969. Every clubhouse has its own ensemble. There are also singing and music circles, as well as training courses on computer, tailoring, board games, military patriotic and arts are functioning in the clubhouses. There are 8 clubhouses, including the Martyr Azar Niftaliyev clubhouse, Samad Vurgun clubhouse, Nariman Narimanov clubhouse and others, in the town. The Mingacevir Historical Museum was established in January 1968. The museum has two branches – Martyrs’ Memorial and Independence Museum. The museum has 14,461 exhibits. The city is also home to Mingachevir Gallery, which includes 310 works of art.